Mat 6:21 "For where your treasure is, there will your heart be also. " Use something you treasure on your card - whether it be bling, flowers, something new or have been saving for a long time - show us your treasures! The two verses before vs. 21 tell us not to store up for ourselves treasures on earth, fo(r they will all be gone one day)... but rather to store up treasures in heaven, (for those things have eternal value). Our time here is so short, yet we strive to hold on to all the "stuff" of this life with all our strength. We work longer hours so we can buy more, have more, and then we need to spend more time taking care of all the stuff we have accumulated. When we look at life through spiritual eyes, we realize that we came into this world with no "things" and we will leave this life with no "things"... and the only time spent during this life that will matter for anything in eternity is that time spent doing God's work... whatever He wants us to be doing. We need to be about His kingdom and doing things that will matter for eternity. If we're not sure whether we are doing that or not... this verse tells us.... where your treasure is, there your heart will be also. If you find yourself totally wrapped up in this world, the things of this world, and find little time for God or doing things that bring honor and glory to Him, chances are your treasures are here on earth... and they are temporal. I don't know about you, but I really want to hear Him say "Well done, good and faithful servant". I know I fail often in this area... but it certainly is the desire of my heart to make a difference that will last for eternity. I have used Layers of Color Flutterescent Clear Art Stamp set and Our Daily Bread designs Happy Birthday set for this card. The butterfly is stamped with Color Box Paintbox Pigment Variated Pad, and then sprayed with Pearl Glimmer Mist and distressed with T Holtz Walnut Stain Ink. The Birthday sentiment was stamped with Groovy Guava (SU!) directly on the panel. I embossed the upper part of the panel with a Cuttlebug folder (sorry I can't remember the name) which I had inked with Groovy Guava. I wrapped my ribbon around and adhered my main panel to the SU! Very Vanilla base. My treasured item is the pretty crocheted element saved from a dear loved one's sewing box. It actually looks like the old shade pulls they used to make with solid plastic rings inside, but she had started to attach them together to make perhaps a dresser scarf or something. There is a cluster of about 10 of these. I carefully disassembled it and used one on my card today. I treasure it because of the loving hands that created it tenderly many years ago. My leaves and boughs are punched with Martha Stewart punches. For the leaves I used my embossing stylus to create veins and then sponged distress ink on the edges. I made the ribbon rose after watching a YouTube Video and I love how it came out. It is made from the same ribbon I wrapped around the card. The amount of ribbon it takes depends on the size you make your rose. I made several small ones, and then this one was the largest I made. I think I used about 22" for this one. We want to thank Simon Says Stamp for their continued support of Stampin Sisters in Christ! 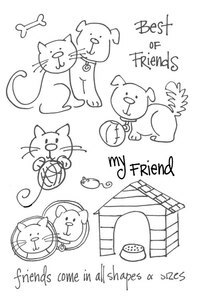 Please stop by their store for the best selection of stamps on line! 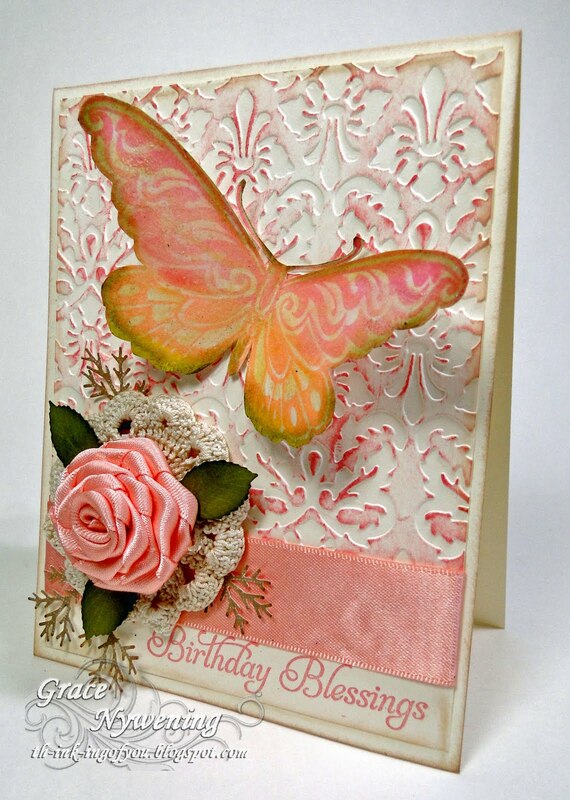 I wanted to enter Eva's Butterfly blog hop with this card... she has some incredible prizes up and some absolutely stunning cards so if you love butterflies... hop on over to her Blog! Thank you so much for stopping by and I hope you have a blessed week! This card is so beautiful, Grace! I love it! Good morning Grace! What a stunning card this morning, beautiful colors and that ribbon rose is gorgeous. Great insight on the verse this morning. Have a fabulously blessed week. What great thoughts you shared this morning Grace! My heart's desire too is to hear those words from the Lord; actually I'll be happy just to be there! Lovely creation and that bit of crochet is beautiful as is the rest of the card. What a gorgeous card Grace! Love your treasured item here. My MIL has crocheted many items for myself and my girls, but they'd be too large for a card. She is the one who taught me how to crochet too, so now I can make things like little flowers to doilies to afghans. She is definately more of a treasure than any of those items, and I realize I should be making more effort to visit her more often as who knows how much longer she'll be here. She's 84 and lives in the next town. Thank you for sharing your thoughts Grace. HUGS! Oh my GOODNESS GRACE I soooo love this design, that flower is soooo beautiful with the added crocheted flower how genious is that and sooo different, soooo BEAUTIFUL!!! Your butterfly and texture is FABULOUS!!!! Another stunning creation sweetie!!!! Oh my goodness - I would treasure that flower too! So pretty. Your card is amazing, as always. I loved reading your devotion. Thanks for being a treasure in my life! Have a wonderful week! Wow, I don't know what to say. You took my breath away with this one, Grace! It's one of the most beautiful cards I have ever seen. Everything is perfection and I really love the treasured crochet circle you included. I have a number of pieces of the "fancy work" my grandmother used to do and treasure them also. Thanks so much for the link to the UTube video. I have watched others and tried to make the ribbon flowers and have always ended up with a sad mess, but I watched this one and I think I will give it another try. Stunning, your cards just are so pretty! So very, very beautiful!! I love your work. This is beautiful grace. So lovely. I love the colors. what a work of art! GREAT job!!! Wowwwww Grace,What a wonderful card,I love the paper and the colours. love the ribbon rose on this card. my friend is making ribbon roses to use on cards. another beautiful card. This is gorgeous Grace!! I just love your pastel colors and your design with that stunning flower. I just love the sheer elegance with the butterfly and the inked embossed background. Gorgeous! Gorgeous! Gorgeous my treasured friend. Your treasure is wonderful, how nice to have such a reminder of loved ones. The whole card is fabulous my talented friend! Absolutely stunning! What a work of art. Absolutely GORGEOUS card, Grace! The colors are beautiful, as the butterfly and the STUNNING rose! Thank you for sharing the link to the tutorial and thank you soooo much for the verse and your insight on it!!! Oh My Word!!! Grace this is just gorgeous!!! The soft colours are beautiful, love the butterfly and THAT FLOWER took my breath away!!! Stunning!! Oh my word! This is BEAUTIFUL! I am in love with this card! Just gorgeous! 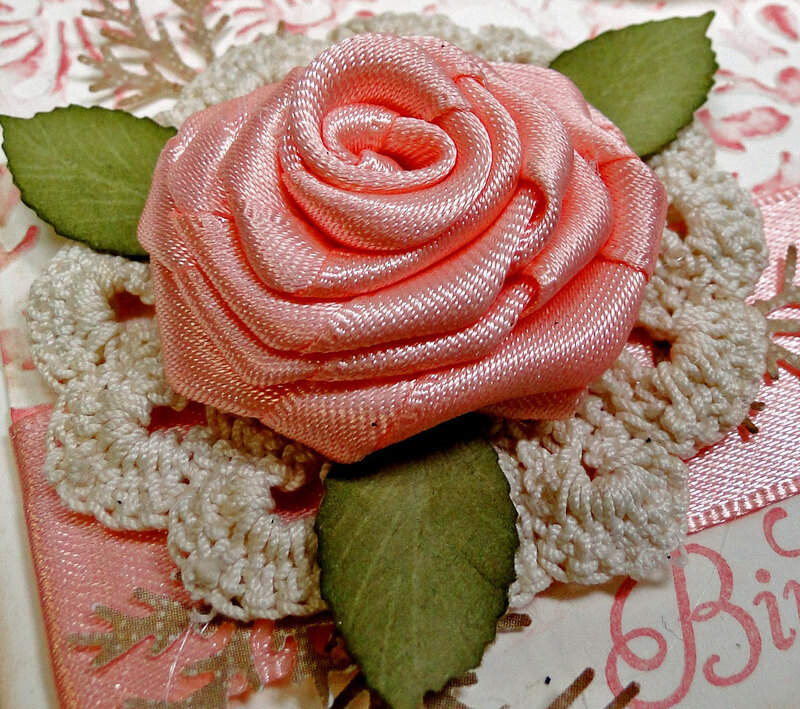 Wow Grace that is a Stunning handmade Rose adorned on top of an even more stunning crochet flower. I love the Peace this card has and the Love you put into every detail. Thanks for sharing with us this week at the Sugar Creek Hollow Challenge. Absolutely beautiful card, Grace. The flower is awesome, I've got to try this. Thanks for joining us this week at PCJ. I have to ask ... I am new to the wonderful world of *Cuttlebug*!! Did you actually INK your embossing folder? I've been thinking of doing that, but was afraid to! DO TELL!! :) - if you don't mind. Grace. This is gorgeous. I love how your rose turned out. The crocheted lace behind it really makes it stand out. I love the antiqued look that your inked embossing looks. One of my favorite butterflies!!! Great card my friend. Have a blessed day today!! My, my this is just stunning Grace! Pure elegance and beauty, your rose is a true vision! Thank you for joining in our handmade flowers challenge, I would have to say you knocked this one right out of the park!! Grace, this is absolutely gorgeous!! Great job on the ribbon flower! And I really like the way you inked the embossed paper. Very, very nice! WOW this is sooo sooo beautiful I love the flower its gorgeous. Thank you for joining us girls over at CPF Challenges, good luck. Thank you for joining Delightful Challenges this Week! Beautiful card! Thank you for sharing! WOW what a stunning card...love your fabulous ribbon rose!! Thank you for joining us in our monochrome challenge at Simply Create we do hope to see more of your creative work at the next challenge. I'm so glad you've joined the Sugar Creek Hollow handmade flower challenge this week. 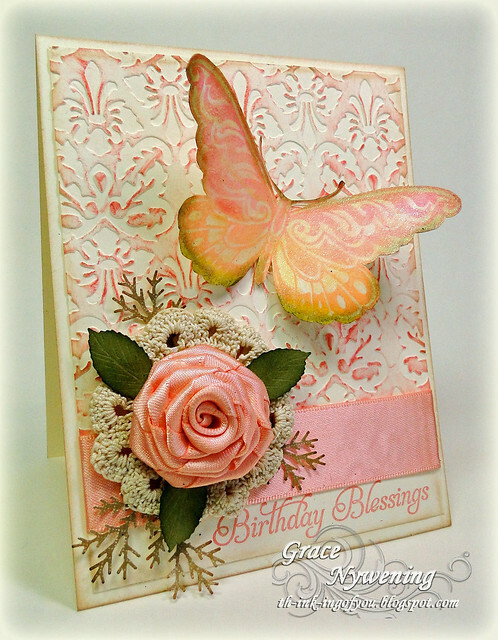 Your card is absolutely stunning - so very beautiful with the embossed texture, gorgeous 3D butterfly and that pretty handmade rose flower. I'm heading to the tutorial on that to give it a try. 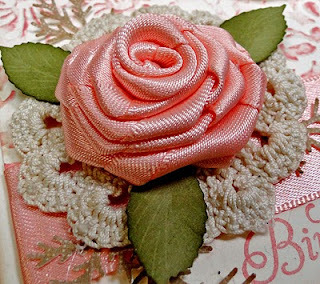 I love the sentimental value of that vintage crocheted flower behind the rose. It too is a beautiful touch on your card. Thanks for playing in the Sugar Creek Hollow challenge this week. I do hope you'll return to more of our challenges. Grace, this is just breathtaking! What an exquisite card, love the butterfly and your "treasured" crochet element - your flower is just AMAZING! Thanks so much for joining us for this week's Sugar Creek Hollow challenge, I love seeing your creations! This is simply elegant, love it! Thanks for joining us at SG!